Bleading gums, what it means and what you need to do. Seeing blood in your sink after you brush your teeth can be alarming, but there’s no need to panic. You may be able to cure your bleeding gums without even seeing a dentist, depending on the situation. 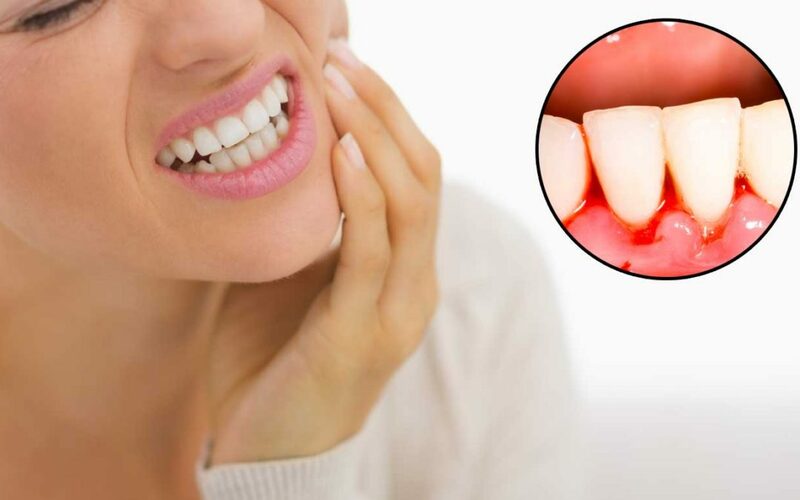 In this article, I’ll explain the common causes of bleeding gums, what you can do to stop the bleeding and how to know when it’s time to see your dentist in Fresno Ca. If you examine your gums, they should be a healthy shade of pink, not red. You can notice they make a C shape around the neck of the tooth (where your tooth begins to get skinnier). Where they touch your teeth, they form a small groove, like a collar around the tooth. Though they are a tiny part of your body, gums have a big job. They protect the neck and roots of your teeth from bacteria. Without healthy gums guarding your teeth, bacteria can sneak beneath your teeth, damaging tissues. Over time, the tissues become too damaged to hold your teeth, leading to loose teeth that can even fall out. As bacteria grow and move, they irritate your gums, causing gingivitis. Gingivitis is the early stage of gum disease, and its most common symptom is bleeding gums. Besides bleeding gums, you could also have gingivitis symptoms like red gums, sensitive gums and bad breath. Luckily, this stage of gum disease is reversible. Your dentist can help scrape away plaque and bacteria. Brushing and flossing keeps the bacteria away for good so you can enjoy healthy gums. When you are pregnant, changes in your hormones affect your entire body. Your gums are no exception. Hormone changes can cause “pregnancy gingivitis.” Your gums may swell up and become sensitive, causing bleeding when your brush or floss. To avoid oral health issues, talk to your dentist about how to care for your teeth when you are pregnant. The medicines you take can make your gums more likely to bleed even if you have excellent brushing and flossing habits. Blood thinners and aspirin keep your blood from clots that stop bleeding. These medicines especially increase your risk of bleeding gums and may cause your gums to bleed for a long time after brushing. You should tell your dentist Dr Donan, in Fresno, if you are taking these medicines. We dentists want to help your mouth be as healthy as possible, but if we don’t know about your general health, we can’t give you the right care. If you have just started a new oral health routine, such as brushing or flossing more often, your gums may bleed until your mouth gets used to the new habits. Brushing and flossing clears away bacteria and plaque from your gums. As you practice these good habits, you gums should bleed less and less and eventually stop altogether. But if your gums bleed regularly, such as every time you brush your teeth for a few weeks, I encourage you to make an appointment to see your dentist soon. You should also call your dentist in Fresno if your gums bleed for a long time after you have stopped brushing or flossing. While bleeding gums aren’t a cause for panic, they are a sign that you need to make positive changes to your oral health routine. I would encourage everyone to improve their gum health with these tips. Brush and floss twice a day. Flossing pulls bacteria out of the grooves around your teeth and prevents plaque from building up. Brushing also removes the layer of bacteria on your teeth. If you bleed when you brush or floss, it does not mean that you should back off. Remember, healthy gums don’t bleed when brushed. So it’s not the brushing, it’s the inflammation, or state of disease that makes them bleed. In dentistry we call this “bleeding upon provocation”. Use an electric toothbrush. Electric toothbrushes can remove plaque and bacteria around your gums more effectively than regular toothbrushes. These brushes move faster than you ever could move a brush while still providing a gentle clean. See your dentist regularly. You should see your dentist for a cleaning at least every six months or more often as your dentist suggests. During cleanings, your dentist removes plaque build-up on your teeth. Your dentist can also answer questions about bleeding gums or other oral health issues. Avoid tobacco. Tobacco products, including cigarettes and chewing tobacco, hurt all aspects of your health, including your oral health. Tobacco destroys your teeth and gums, leading to tooth decay and loss of teeth. Eat a healthy diet. The foods you eat impact the health of your mouth. Sugars and starches provide food for bacteria, helping them grow. Eating throughout the day also can increase the amount of bacteria in your mouth. Reduce how many carbohydrates and snacks you eat to experience better oral health. Nose breathe at night and during the day. If you are a mouth breather, find a solution (your dentist can help). Even healthy gums will change color and will be more likely to bleed as a dry mouth changes pH and allows the wrong bacteria to become dominant. If you see that mostly you anterior gums are swollen and red, and not the posterior gums, this could be a result of as simple as mouth breathing. Try mouth taping when you go to bed tonight to see if that helps! So many of us find it easy to ignore the presence of blood in our mouth. We see at the dentist when we get our teeth cleaned.It’s routine, right? Remember It’s important to realize that gum disease has greater ramifications to the rest of the body. Gum disease is actually a greater predictor of morbidity than heart disease is. Next time you see blood on your floss you should think of this fact. The only real good solution to fixing those bleeding gums, ultimately, is a trip to the dentist. I hope this post has convinced you of that.